El Niño-Southern Oscillation Myth 1: El Niño and La Niña Events are Cyclical | Watts Up With That? This is the first of a series of posts that address many of the myths and misunderstandings about the tropical Pacific processes that herald themselves during El Niño and La Niña events. Most of the content will be chapters from my recently published ebook Who Turned on the Heat? What part of oscillation don’t you understand? Haven’t you ever heard of the ENSO cycle? El Niño and La Niña are parts of a cycle. How can a cycle cause long-term global warming? Comments like that are the first clue their authors are arguing from ignorance; that is, they have no understanding of the subjects being discussed—none whatsoever. First off, it indicates those persons have never examined an ENSO index, such as the sea surface temperature anomalies of the NINO3.4 region—an area along the eastern equatorial Pacific bordered by the coordinates of 5S-5N, 170W-120W. ENSO indices are used to indicate how often El Niño and La Niña events happen, how strong they were, and how long they lasted. If El Niño and La Niña events were cyclical, they’d transition between El Niño and La Niña then back to El Niño and on to La Niña again, and so on. But they don’t cycle between El Niños and La Niñas. There can be back-to-back and back-to-back-back El Niño conditions without La Niña conditions appearing between them. See Figure 1. And there can be the double-dip La Niñas, like we’ve experienced recently. Part of the confusion stems from the term El Niño-Southern Oscillation, which is really the combination of two names. Some of the confusion stems from the attempts of climate modelers who often treat the processes of ENSO as cycles in their failed attempts to simulate ENSO. CHAPTER 2.1 DO THE WORDS “OSCILLATION” AND “CYCLE” IN THE NAMES “EL NIÑO-SOUTHERN OSCILLATION AND “ENSO CYCLE” CAUSE MISUNDERSTANDINGS? The words oscillation and cycle are used to describe the processes of El Niño and La Niña events as a single phenomenon. The commonly used term ENSO stands for El Niño-Southern Oscillation. The seemingly redundant term ENSO Cycle (El Niño-Southern Oscillation Cycle) is also used often. Many persons assume because cycle and oscillation are used to describe El Niño and La Niña that the two states oppose and offset one another, that a La Niña will counteract an El Niño. Bad assumptions. They definitely do not work that way. The most obvious difference between the two states, which we discuss in Sections 1 and 3, is, El Niño events randomly release vast amounts of warm water from below the surface of the west Pacific Warm Pool and spread it across the central and eastern equatorial Pacific, but the reverse does not occur during La Niña events. Are El Niño and La Niña events cyclical or oscillatory? Some parts are, and some parts aren’t. We’ll discuss this further in Chapter 4.17 ENSO – A Cycle or Series of Events? The interannual variability of sea surface temperature (SST) along the Peru-Ecuador coast is dominated by the El Niño phenomenon. The name El Niño was originally applied to a weak warm coastal current which annually runs southward along the coast of Ecuador around the Christmas season (Wyrtki 1975). In scientific usage, the term has now become more narrowly associated with the extreme warmings which occur every few years (Wyrtki 1979a), and which result in catastrophic effects on the ecological system of the region. In more recent years, Ramage (1975), Weare et al. (1976), and others have used the term to encompass the larger-scale features of the warming event; i.e., the upwelling area along both the equator and the South American coast. It remained, however, for Sir Gilbert Walker, in a classical series of papers (Walker, 1923, 1924, 1928; Walker and Bliss, 1930, 1932, 1937) to name the SO [Southern Oscillation] and describe the salient features of the surface pressure, temperature and precipitation fluctuations. The full title of the first Walker paper is WALKER, G. T. (1923). Correlation in seasonal variations of weather. VIII. A preliminary study of world-weather. Memoirs of the Indian Meteorological Department 24(Part 4) 75–131. These papers by Walker were not discussions of El Niño, however. The link between El Niño and the Southern Oscillation wasn’t established until the 1960s. Therefore, the word oscillation in Southern Oscillation does not apply to El Niño and La Niña events or their processes. It only applies to the impacts of El Niño and La Niña on the sea level pressures in Tahiti and Darwin, Australia. The sequence of papers and the advancement in ENSO research is further described in Rasmussen and Carpenter (1982). Then there’s the term “ENSO Cycle”. The NOAA Climate Prediction Center (CPC) and many others, including me, use the phrase to describe El Niño and La Niña events and the variations from one state to the other. Refer to the CPC’s wonderful series of ENSO-related web pages ENSO Cycle that we’ll use for further discussions in Chapter 4.14 Impacts of ENSO Events on Regional Temperature and Precipitation. El Niño and La Niña events do not repeat in time, there are very few things that are repetitive in ENSO, so by this definition, ENSO isn’t a true oscillation. In fact, Wikipedia writes in their initial description of El Niño-Southern Oscillation. El Niño/La Niña-Southern Oscillation, or ENSO, is a quasiperiodicclimate pattern that occurs across the tropical Pacific Ocean roughly every five years. Oscillation is much easier to write than “quasiperiodic climate pattern”. To add confusion, “pattern” has multiple meanings. It could be used as “pattern in time”, or to describe a “spatial pattern”, as in the warming or cooling of the central and eastern equatorial Pacific. Because an El Niño event does not always lead to a La Niña event and because La Niña events can be followed by another independent La Niña event, this definition of cycle under “c” is applicable to ENSO. The term Southern Oscillation is used to represent the effects of El Niño and La Niña on the sea level pressure of the off-equatorial South Pacific. We’ll discuss it further in Chapter 4.3 ENSO Indices. Also discussed in that chapter, there’s another widely used ENSO index. It represents the effects of El Niño and La Niña events on the sea surface temperature anomalies of the equatorial Pacific region called NINO3.4, which is bounded by the coordinates of 5S-5N, 170W-120W. The Southern Oscillation Index and NINO3.4 sea surface temperature anomalies do NOT represent the process of ENSO. They are used only to indicate the frequency, strength and duration of El Niño and La Niña events. They indicate nothing more. They do not represent the process of ENSO, only its effect on the variable being measured for the index. El Niño-Southern Oscillation and ENSO Cycle are convenient phrases used to describe El Niño and La Niña. El Niño and La Niña events are not repetitive in time so they are not true oscillations. If it’s understood that an ENSO cycle may not lead to another series of El Niño and La Niña events nor even lead to the opposite phase, then cycle is applicable. It’s a lot easier to write El Niño-Southern Oscillation than it is to write El Niño-La Niña/Sea Level Pressure Difference Between Darwin and Tahiti Quasiperiodic Climate Pattern. CHAPTER 4.17: ENSO – A CYCLE OR SERIES OF EVENTS? If you were to Google ENSO and cycle, you’d get over 700,000 results. Limit your search to Google Scholar and there are more than 39,000 results. Place “ENSO cycle” in quotes and there’s almost 5,800. One of the reasons: ENSO stands for El Niño-Southern Oscillation and oscillation implies cyclical behavior. Another reason: the delayed oscillator theory suggests that one phase leads to the next, and that sure sounds like a cycle. However, is ENSO really a cycle? The need to treat ENSO as a cycle arises from the attempts to model ENSO with computers. Mother Nature, however, apparently isn’t concerned about our ability to model it. While parts of ENSO act as a cycle, the evolution of an El Niño event requires a basically random event to initiate it. Therefore, to answer the title question of this chapter, ENSO is a combination of the two. After early ideas that saw El Niños as isolated events, the advent of coupled models brought the conception of ENSO as a cycle in which each phase led to the next in a self-sustained oscillation. Twenty-two years of observations that represent the El Niño and La Niña peaks (east Pacific SST) and the memory of the system (zonal-mean warm water volume) suggest a distinct break in the cycle, in which the coupled system is able to remain in a weak La Niña state for up to two years, so that memory of previous influences would be lost. Similarly, while the amplitude of anomalies persists from the onset of a warm event through its termination, there is no such persistence across the La Niña break. These observations suggest that El Niños are in fact event-like disturbances to a stable basic state, requiring an initiating impulse not contained in the dynamics of the cycle itself. When studying this subject and looking for additional papers, it is important to isolate discussions of models and the efforts being taken to improve them. Models are not reality. They are attempts to simulate Mother Nature with computers. The discussion of whether ENSO is a cycle or a series of events is an observations-based discussion. Some of the model-based papers do include discussions of observations, but you have to make sure you’re basing your understandings of ENSO on the observations and not the models in those papers. That pretty much holds true for all climate and climate change papers. Who Turned on the Heat?was introduced in the blog post Everything You Every Wanted to Know about El Niño and La Niña… …Well Just about Everything. The Updated Free Preview includes the Table of Contents; the Introduction; the beginning of Section 1, with the cartoon-like illustrations; the discussion About the Cover; and the Closing. The book was updated recently to correct a few typos. Oh. Here we go again. Where does the energy come from to raise the temperature? The fish? You used the word “heat” 6 times in your post, 5 times in “who turned on the heat”. If ENSO is not actually cyclical, it then becomes invalid to do as Foster and Rahmstorf did, and try to adjust it out of existence. If it is part of the processes by which natural forcings change global temperatures, then it is an integral part of any positive or negative temperature trend. Bob: I find your presentations to be amazingly clear. I can imagine children in junior high and high school gaining a lot from this presentation on the 24 hours of WUWT! You speak well, and thoroughly support your statements. You have a nice way of thoroughly explaining subtle ideas that I believe average “joes” can understand. You do this without sounding like you’re talking down to the listener. You boldly go against the grain of accepted (mis)understanding of the science in what I feel is a complete and balanced way. I enjoy being an outspoken minority in liberal CA. I often tell folks who believe in AGW, that I will learn more by being proven wrong once, than being right all the time… and I am still waiting to learn something from AGW believers. I watched “Inconvenient Truth” around 2007-8. At the time, I did not think much about AGW, either way other than it seemed reasonable that CO2 could increased temperatures. However, after I watched Gore’s movie, something did not seem right. I felt like I was being lied to… the claims were so over the top, and Gore was so condescending I felt sickened. Around 2009, I read State of Fear, which I understood was fictional. However, that book left me inspired to go on a quest to seek what’s true. I spent thousands of hours combing the Internet to read and listen to both sides of the argument. It surely seemed politically biased, especially with the AGW doom crowd. Lots of people on both sides had varying degrees of credibility. I eventually landed on Anthony’s WUWT and found myself gradually using this site more and more as a source of balanced and entertaining information. WUWT is a time saver for me to keep current on news, the subject matter of which is the most important information we world citizens need. It’s our duty to understand why our wealth is being hijacked by a false god which wants to drive us into poverty to save us from a fictitious doom. Thank you Anthony for nurturing this forum. I see the chicken littles are ariving quickly on this post. I also see some people dont understand even a little bit chaotic nonlinear systems behaviours. Nice post Mr. Tisdale, thank you for sharing your knowledge, I learn something new everytime you post here. @trafamadore: Evidently, you are asking the wrong question. Of course the energy comes from the sun… I believe if I could answer in just one sentence it would be: The amount of energy that remains on earth varies based on albedo changes. I believe the point is that energy is stored and released (in the water). Sometimes ENSO processes reveal more dry air during La Ninas, which then allows more sun exposure. So atmosphere cools off, but ocean absorbs heat… Imagine that, the air gets colder while the earth gains more heat. Can you at least imagine that? There can be back-to-back and back-to-back-back El Niño conditions without La Niña conditions appearing between them. I agree with Bob’s general position on this. I have made the same point here in general a number of times: an up a down and an up do not a cycle make. However the statement above is a little weak because he has no real way of properly distinguishing a supposed multiple el niño from a single extended el niño. Also this whole thing feels like a straw man argument. The pros do not really consider el niño to be an actual cyclical process. They are more likely to consider it to be the outcome of some chaotic process involving ocean currents, with some characteristic time scale set by the size of ocean basins. Clear and to the point. I like that. Most important is the recognition that nature does what nature does. Natural dynamic processes are almost always irregular when viewed from artificial time scales. One thing I’m am not ignorant of, there are lots of things I just don’t know. But one thing I do know. If it can’t be taxed and/or used to exert control over me and my fellow planet dwellers in the name of CAGW, it must not have anything to do with CAGW. ENSO is just one little piece of the chaos that results in “Climate” which will continue to “Change” no matter what we do. Bob, thanks for your continued work to make one piece of the puzzle less puzzling. Ponder this question, trafamadore: How could the 1995/96 La Niña have created the fuel, the warm water, the HEAT, for the 1997/98 super El Niño? It’s rather simple if you understood the interrelationship between the sea surface temperature of the tropical Pacific and the trade winds, and cloud amount, and downward shortwave radiation (visible sunlight), and ocean heat content. There’s nothing new here, trafamadore. ENSO is a relatively simple coupled ocean-atmosphere process. Here’s something else for you to ponder. It’s a graph of Ocean HEAT Content data for the tropical North Atlantic during the ARGO era, trafamadore. Notice how the tropical North Atlantic ocean HEAT content mimics the variations in the ENSO index. Sure does look like ENSO is causing the Ocean HEAT Content for the top 700 meters of the tropical North Atlantic to rise and fall without any direct exchange of heat. If you understood teleconnections, trafamadore, and how they cause the sea surface temperatures AND ocean heat content to vary in the tropical North Atlantic, you wouldn’t ask your questions in such a foolish fashion. I noted in the post that one of the future posts is titled “Failed Argument – El Niño Events Don’t Create Heat”. Hang around for a couple of weeks and I’ll cut and paste a chapter from my book to answer the questions you’ve posed so foolishly. In the mean time, we here at WUWT enjoy trolls. That’s what you’ve become–just another troll. Mario Lento: Thanks for the kind words. Since you’ve read “State of Fear” more recently than I, a question for you. If memory serves, it opened with a murder at the ocean simulation tank at a research institute (in France possibly). I believe the researcher was studying tidal waves. Was that murder ever mentioned again? It’s funny, I often tell people I have a bad memory. But, really, I think I have a selective memory. I do not at all recall the story… I focused on the Scientist in the story and hung on how well he reacted to people who felt passionate about things they obviously did not understand. When I was a around 7 or 8 years old, I read science and biology books, and encyclopedias. I found “stories” and history boring. As of late, I’m trying to train my brain to think past “how things work.” I have been trying to read stories for the enjoyment of them as well as history, and the US founding documents. When I read the book again, I will think of you and post an answer to the question. I tell you this, I will have a whole new appreciation, and perhaps even self critique of the book next time. It focused a lot on the UHI effect, but I do not recall a lot more than that… just that it was a starting point for my quest to understand what we do know or don’t know about climate. Here in the midwestern US we continue to be in a dry weather pattern, and we need some serious rain in the coming months. The pundits tend to blame EL NIno, but if things don’t change next year’s harvest will be a disaster. Five days ago on WUWT the question of “where does the heat come from” was asked and answered. Now the first commenter, apparently not liking the answer given, wonders if that heat comes from the fish. So, yes it comes from the fish – actually only the 570 nm/exothermic ones. Now, can we move on? I hate to tell you but you are dead wrong. I proved that it is cyclical in my book “What Warming? Satellite view of global temperature change” already two years ago. You unfortunately have been listening to observations by blind men trying to identify an elephant and getting nowhere. ENSO starts with the trade winds pushing equatorial currents west until the water backs up behind the Philippines and New Guinea that block its entrance into the Indian Ocean. It piles up as the Indo-Pacific Warm Pool and when the pile is high enough reverse flow starts along the equatorial countercurrent. The El Nino wave that takes this path runs ashore in South America, spreads out north and south along the coast as much as twenty degrees, and warms the air above. Warm air rises, blocks the trade winds temporarily, mixes with the westerlies and we observe the warm phase of El Nino. But any wave that runs ashore must also retreat. As the El Nino wave retreats sea level in its wake drops by half a meter, cool water from below wells up, and we have a La Nina starting. As much as the El Nino warmed the air the La Nina will now cool it. This warming-cooling cycle is rather stable over time. There were five such cycles in the eighties and nineties and the temperature balance was so accurate that global mean temperature did not change for eighteen years. When you blow across the end of a glass tube you get a the resonant tone of that tube, determined by the dimensions of the tube. The trade winds are the equivalent of blowing across the tube and the ocean answers with its resonant tone – about one El Nino wave every four-five years. This has been going on as long as the present equatorial current system has existed, which is to say ever since the Isthmus of Panama rose from the sea. If I recall correctly, the final closure of the Panamanian Seaway was just under two million years ago. An interesting tidbit is that people interested in El Nino have empirically established the Nino3.4 observation post right smack in the middle of the equatorial countercurrent. There it watches the El Nino waves go by and gives us seven months advance notice of the arrival of an El Nino because it takes that long for an El Nino wave to get from the mid-Pacific to the South American coast. Hey, you are great. Don’t answer my Q, and then direct me to a 55 min video to watch. Look, I know the temperature goes up and goes down and that various things correlate with it, and it causes my snow in Michigan to melt more some years than others. I got that, really. To me it seems no different that a cat randomly jumping up and down on my scale when I am weighing myself; I can get the weight if I carefully average out the readings. But at the end of three decades I’m heavier than before, and the ocean, it’s warmer than before. While the idea of explaining my extra weight with jumping cats is attractive, it seems you really can’t explain where the extra energy comes from. And I could say it in less than one sentence. Interesting article. I have often wondered about these terms but until now have never gotten around to finding out more about them. What I find amusing is how CAGW alarmists often cite the Nino siblings as being the reason their models failed as if they are random inputs to the climate and not something that their expensive GIGO ‘never to be questioned’ models are actually supposed to be predicting! At the risk of suffering the wrath of some I’ve got some questions. Maybe i don’t understand so please take it easy on me. Warm water gets transferred to the deep oceans. Let’s say 2,000 meters. The warm water may be down there for years. How does it stay warm? The deeper you go the colder it gets…correct? At least when i go swimming it does. Lets say i can dive 2,000 meters. I have a thermos of coffee with me. When i get to 2,000 meters i open the thermos & pour out the coffee. Won’t the coffee soon be the temperature of the water at 2,000 meters? I honestly don’t know how warm surface water transferred to deep ocean levels stays warm. Now the warm water I’m guessing just don’t sit in one place. It goes where ever the currents take it. So how does anybody know where it will resurface? Is your book; “Who turned on the heat ?” available from the usual suspects ? I have tried to follow your work, with the various posts, you have presented here for us, but can’t say, I have grasped a whole picture out of it. Not because of any deficiency in your posts; more like attention deficit disorder; with maybe some juvenile Alzheimers thrown in on my part, so it would be nice to have a handy reference in one place. Anyway the flames are clearly visible, even with my monitor turned off, so you must have touched of some exothermia somewhere. 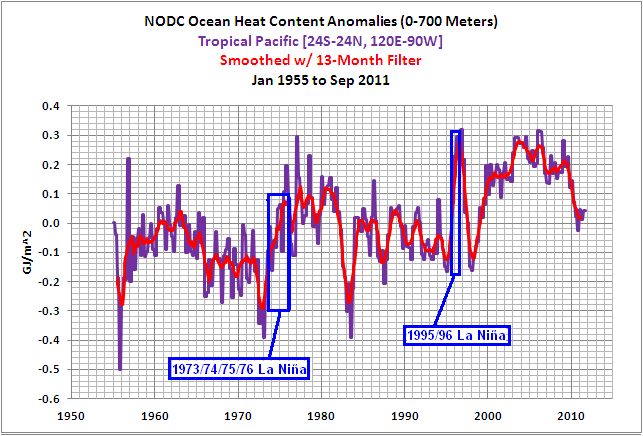 @trafamadore….the NINO3.4 graph does not indicate any “warmer than before” ocean…. “Nino events randomly release vast amounts of warm water from below”….and this is NOT subducted previous warmed surface water. This is water warmed from below on the planets largest geothermal heat sink. The Nino/Nina is a reflection of varying, non-linear nuclear decay. The Earth has the proven ability to refine nodes of Uranium [see Okla: Natural Nuclear Reactors] and these nodes float in the boiling rock mantle. The rolling action lifts hot nodes to the surface where they cool and settle. Most often these heat wave fluctuations are carried horizontally under the mantle to the sea floor vents, occasionally these hot spots occur under the continents, like the 30’s dust bowl and the 2008 Russian heat wave. It is varying Earth fission that causes fluctuations that are non-cyclic in climate and sets the base rate that determines Glacial and Interglacial. The mechanics of this are described in “Earth’s Elemental Petrol Production”. Note to Warmists: There is no atmospheric CO2 signal in the Earth’s 2500F mantle. The energy always comes from the Sun. If it is not clear to you how energy flows arise from storage and release mechanisms, you should ask questions, rather than make offensive and brazenly shallow assertions. Learning for yourself is ALWAYS much more productive. Has anyone got a spoon we can feed the poor boy with ? It’s a very good question, and nice of you to phrase it as you do. I believe the answer is that it is relatively warm water. Not really warm, but warmer than what rose up previously. In a system which has an active source of heat, such as the Sun, and immense reservoirs for storage of heat, you are likely to have oscillatory modes with very long time constants. That is the problem with trafamadore’s (Tralfamadore?) “cat jumping on a scale” thought experiment – this is a very large cat, and the scale has weak and highly elongated springs. Such a system can easily evolve with extended intervals of natural warming and cooling. I do not know if the process to which you refer is significant or relevant, but in any case, I thought I’d provide a link I googled for any who are interested. Hate to dispel myth dispellers, but cyclic doesn’t necessarily mean periodic. Any system that switches between two states (“El Niño and La Niña”) is by definition cyclic even if its not periodic. Simply going from state A to neutral then back to state A before switching to state B does not imply the system is not cyclic. This behavior is actually not that untypical even of truly periodic signals, e.g. one with two main oscillatory frequencies, 3 and 5 years in this case. Technically what we have here is a “quasiperiodic oscillation”, and the way you test whether it is really oscillatory is to compute the spectrum of the time series. If you do that you see very strong spectral peaks associated with the two dominant frequency components of the oscillation. It’s very possible to have otherwise periodic phenomena that get disrupted by “perturbations”. Planetary motion is an example of that. Simply because the system isn’t strictly periodic doesn’t mean we throw out a framework (e.g. Kepler’s Laws and their Einstein generalizations). Most relationships that we observe experimentally are simply approximations, and the test for whether this approximation is meaningful is whether using it has utility. is it cyclic? Yes. Is it oscillatory? Yes? Is it fixed-frequency oscillatory? No. But it’s still useful to describe it as oscillatory. The analogy that you got heavier has nothing to do with what Bob T explains. Nothing at all. I explained it in an over simplification, perhaps not giving any justice to how ENSO works. If you really care to comment, then you should try to understand what is said about the subject matter that you critique. Everyone here who has delved into ENSO, thinks you sound pretty uninformed in your argument. You are the kind of person who argues without understanding what or who you are arguing with. Seriously, you ought not to be critical of things that are more sophisticated than the straw pole argument you make. You have proven to me at least, that you can’t learn. You will learn more by trying to understand why you are wrong in your statements, than trying to ignorantly feel like you are right. Otherwise, you are a bore and remain as such. Oscillate implies going up and going down. ENSO stands for EL Nino Southern Oscillation. This implies when El Nino is over, the next thing that will happen is La Nina. Hence oscillation. But often times we have La Nina, then neutral then La Nina again… then neutral and then La Nina again… before the wind pattern changes and El Nino happens. When there are lots of La Ninas, it seems the El Nino may have stored more heat from the sun into the oceans since La Ninas produce less cloud cover and allow more solar energy to warm the cold waters than would have occurred had El Nino taken place which would created more clouds, this blocking more solar energy. The point is that La Nina’s don’t always follow El Ninos. For those wondering “where did the heat come from”, please remember that TEMPERATURE is not HEAT. Now all it really takes to change the surface temperatures, in steps, cycles, or quasi cycles, is to stir that pot in particular ways. What can do that stirring? Wind can do it. Natural oscillations of ocean currents can do it. Or, my favorite, lunar tidal changes can do it. Why to I particularly like lunar tidal? Because the moon does not just go in circles. It, too, has oscillations. Changes in how round the orbit is, how tilted it is, etc. Interesting enough just at that… yet there’s more. There’s 19 year cycles and even a 1500 -1800 ish year cycle. Cycles that end up laying right on top of some of the solar variations (due to ‘orbital resonance’ – a pervasive property of things in orbit). So all it really takes is that the planets, in their orbital perturbations of the moon, cause variations in the tides and currents in the oceans. Then you will get ‘quasi-periodic’ mixings of cold and warm water that look like changes of heat (to you) but are actually just changes of temperatures at the surface and near surface. And it will even correlate with solar changes causing some folks to say “It’s The SUN!”, when it need not be at all. (Though I still hold out some small hope for a UV and solar wind modulation of clouds too). I agree completely, though I’m not sold on your PSD. Perhaps there is too little data to get particularly good resolution? Many of these quasi-periodic processes observed in climate variables could be modeled as modal expansions of lightly damped 2nd order linear systems driven by broadband noise, and useful predictions derived by applying the Kalman Filter formalism. LazyTeenager, you say: “The pros do not really consider el niño to be an actual cyclical process.” Very likely true. But I most definitely wouldn’t consider for instance Rahmstorf and Foster pros on ENSO. The energy always comes from the Sun. So you are saying Bob Tisdale is wrong then? You think the warming is caused by increased solar activity not from El Niño and La Niña Events? Arno, we discussed this the last time you tried to promote your book with your same explanation of ENSO. Your explanation is lacking and is contradicted by the instrument temperature record. Your explanation includes parts of the couple ocean-atmosphere processes but excludes more important issues. Not disputing what you are saying at all and on top of that we have had no warming for the last 15 years as per the UK Met Office and others. Add them up and we get 33 years of no warming. So it was all hot air in a teacup straight from the late seventies. You might better account for the natural processes behind the oscillation of the SST of the eastern equatorial Pacific. What role does the Humbolt current play, if any? How is it that the trade winds fail? Why do they resume? Does the equatorial counter-current reverse during this oscillation, as Arrak seems to be saying? How does the “warm pool” of the western Pacific originate? Does this “pool” empty during El Nino into the eastern Pacific? Does it fill during La Nina? There are many questions that your posts do not clearly address. 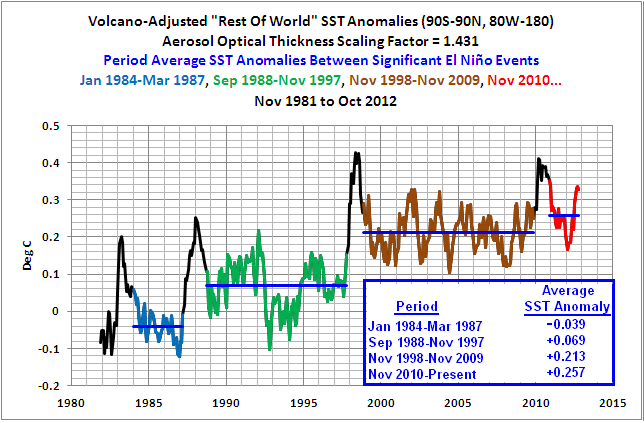 I agree with trafamadore that you have not fully explained the oscillation of the SST of the eastern tropical Pacific. He puts it in terms of “Whence the heat?” Your posts could address more adequately the natural processes involved in these oscillations, it seems. Please edify. 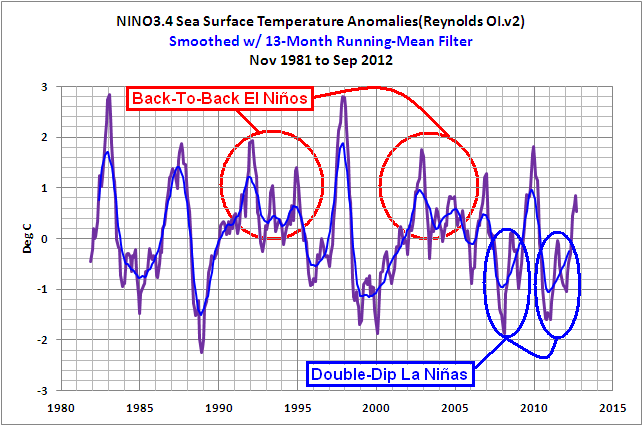 In figure 1, we have a peak shown in 2010 between the double-dip La Ninas that appears larger than the peak of the second of the two back-to-back El Ninos in 2005. In what way is this peak not an El Nino? I did answer your question. You claim to be from Michigan but English appears to be a second language for you. I have done so repeatedly. Apparently you can’t grasp the topic of discussion. My guess is your simple one-sentence explanation would be wrong. Maybe that’s the difference between anthropogenic global warming proponents and skeptics. You’re looking for simple explanations, when the answer isn’t so simple—the real answer requires a person to think. Sorry. It’s only available in pdf form, at present. I’m trying to keep the price down ($8.00US). If (when) I release it in Amazon Kindle form, the price will double due to its size. (As a Kindle file, it’s 55MB if memory serves.) And the price for the pdf version would have to increase accordingly to comply with the Kindle publishing agreement. I took a quick look at paper versions also, but the printing costs were up into 3 figures. That said, you could buy a copy in pdf form and bring the file somewhere for printing on 8.5×11 paper. Even that would be expensive, though. Who Turned on the Heat? is 560+ pages long with more than 380 color illustrations. I agree that to call ENSO an oscillation is misleading. A fluctuation with a constrained timescale would be better, it most resembles the chaotic bifurcation that is typical of complex interactive systems. But I find your hypothesis to explain the recent rapid warming far more alarming than the AGW theory. Consider, we have several thousand years of ENSO records that show no link or role in temperature trends. But you postulate that since the 1950s? this climate phenomena has altered its nature so that it DOES retain thermal energy and cause the climate to warm rapidly. I see no cause advanced for why this change in ENSO h happened. The possibility that reduced energy loss because of an alteration in the radiative transfer process in the atmosphere does not seem to be considered. Even more alarming you provide no suggestion for a limit to this warming. At least with AGW there is a causitive factor over which we have some control. But for your ENSO process that has recently gone into warming mode you provide no cause that would stop this warming so that it could progress to the point of boiling oceans and temperatures beyond those which are viable for multicellular life. Your explanation for the recent rapid climate change is FAR more alarming in its implications and threat to human civilisation that AGW. 2. Their predidictive ability is so poor because they can never hope to come anywhere near to duplicating the extreme complexities of all the factors, which have an impact on our planet’s climate. Most cannot even hindcast with any degree of accuracy. I find it difficult to find fault with the above. Carrick: Thanks for the reply. On the other hand, as I went on to explain in the post, it was found that, physically, El Niño events can be independent events. Spectral analyses may find frequencies in ENSO, but the El Niños are random events. If they’re independent/random, how then are the processes of ENSO oscillatory or cyclical? No. Bob’s post here really only talks about what is meant by ‘cycle’ and ‘oscillation’. So far it seems sensible and non controversial. The terms are used fairly loosely. His main point seems to be that this should not be taken to mean that ENSO or the Nino/Nina part of it should a priori be regarded as “internal variability” , ie long term neutral . This is certainly the way climate modellers regard it without this neutrality ever having been examined or established. CALLING something a “cycle” is somehow substituted for determining WHETHER it has a long effect. So far I’m right with Bob on this. He makes a very good point. The thing is that the two Nino/Nina parts do not act in the same way nor by the same mechanism. El Nino dumps heat form the oceans into the atmosphere by evaporation and radiation. A large proportion of this is destined to end up in space. Despite warming SST and air temps short term, El Nino events actually represent a loss of heat energy from the system. They are “global cooling” in action. Contrarily, La Nina is a period when colder ocean surface temperatures and clearer skies produce notable INCREASES in ocean heat content (OHC). They are “global warming” events. However, this is NOT the same energy which El Nino put into the atmosphere coming back. There is an overall process of capturing solar energy (which answers trafamadore ) during La Nina , dumping it to the atmosphere during El Nino and its subsequent leakage back out of the system into space. This is an on going process alternately increasing and decreasing total energy stored in the Earth system by affecting what is going in and out of the system. It is NOT “internal” energy and very likely not long term neutral. It should be clear form this that variations in how often these events occur, how long they last and how strong they are provides a means of getting a net increase of decrease of energy in the Earth system as a whole. That provides a _mechanism_ for global warming and/or global cooling. Bob has drawn attention to something very important here, this is the MECHANISM for global warming/cooling and very likely this is one of the major negative feedbacks that has maintained the climate system relatively stable over millions of years over huge variations in other external and internal factors ( like CO2 levels of 4000ppm compared to today’s 390 ppm). What Bob still refuses to see is that this is just the _mechanism_, it does not address the _cause_. I’m sure we’ll get the chance to discuss that (again) when he does his follow-up articles. The other point of the post was that El Nino events were found to be independent events, physically, and therefore the processes of ENSO were not cyclical. I have a copy of this novel, which I value for its bibliography on environmentalism and related topics, as well as for Crichton’s essay on ‘Why politicised science is dangerous’. The murder victim in the first chapter was indeed studying wave mechanics in Paris. He is entrapped by a character called Marisa, in whose apartment he (seemingly) gets stung and paralysed by a tiny Australian octopus and is then drowned in the Seine. Such octopodes re-appear later in the novel. Marisa and her co-worker Jim also re-appear, when they try and fail to entrap the rich benefactor Morton. I don’t recall any further references to the initial murder. It’s not a hypothesis, izen. It’s how the data accounts for its warming. It’s blatantly obvious, but there are those, like yourself, who chose to accept the obviously flawed hypothesis of greenhouse gas-driven global warming when the sea surface temperature and ocean heat content data contradict that hypothesis. Please provide a link to the dataset that presents the instrument-based temperature measurements for “several thousand years of ENSO”. Actually, I have, but it’s likely you missed those discussions. I can’t present all subtopics associated with the long-term effects of ENSO in each of my posts. I don’t believe I said or implied that it wasn’t an El Nino. That spike is, in fact, the 2009/10 El Nino. mpainter says: “You might better account for the natural processes behind the oscillation of the SST of the eastern equatorial Pacific. My guess is you’re new here or you’re electing to ignore the dozens and dozens of posts I’ve written on the subject of ENSO and its long-term effects–posts that have been cross posted here at WUWT. In those posts, you would find that I have accounted for those processes. You then went on to ask seven questions, which are very basic process-related questions about ENSO. For me to answer each of your questions in response to the way you asked them would take me longer than it would for you to watch the video linked in the post. I’m not willing to make that effort for you, mpainter, when you’re not willing to make the effort to learn from what was presented and linked to the post. It’s why I included the link. Also, it is impossible for me to present the answer to every conceivable question about ENSO in each of my posts. Each one of my posts would have to be book length—and they’re long-enough as it is. The fact that you agree with trafamadore, who presents troll-like behavior, is troubling. I think that as Bob says that ENSO is powered, in simple terms, by the sun it is reasonable to surmise that if the sun were to go into a cooling phase the effects of ENSO would be weaker. Essentially regulating and preventing it from being an endless cycle of heating. Has the strength of past ENSO ever been plotted against the suns oscillations? That would be interesting to see. Of the top of my head the strength of the most recent period of ENSO (which was strong and Bob argues caused warming) certainly matches up to an active solar period (based on my understanding of Dr. Sebastian Lünings presentation that was recently uploaded) . So, does this follow in the past? Clyde, your December 3, 2012 at 9:42 pm comment appears to include questions about thermohaline circulation or meridional overturning circulation. Unfortunately, they’re topics not often discussed here at WUWT, but you may get lucky and find someone with backgound in those processes to answer your questions. Thanks, Coldish. It’s been a while since I read the book and I couldn’t recall those links. If you even suspect this to be true–I hope it isn’t–it wouldn’t hurt to try something cheap and safe that might help. The recent warming up to the 1998 hot ENSO were occuring during a period of reducing solar output. Ah, now the problem is my English. But apparently, I _have_ got my Qs across just fine. You know, you like to say the AGW scientists don’t know what they are talking about, but at the end of the day they have a spread sheet out of their computers and all the numbers add up. Something goes in, it sloshes about in the modeling computer, but what comes out equals what goes in. You know, that “math” thing? You have the sloshing about part right, but you have failed to do the math. And in the end, that’s the real deal. Why don’t you just do it and present it in a simple table? Until you do that, your “hypothesis” is a verbal shell game. I have long appreciated Bob’s effort in analyzing ENSO. I think he has done a great job of describing the phenomena during the warm phase of the PDO. However, I think he is only half done (sorry Bob). As we have seen with the recent fizzle of what appeared to be a coming El Niño event, it may very well be that ENSO acts differently during the cool phase of the PDO. IIRC, Bob believes the PDO is mostly an aftereffect of ENSO, but I’m not so sure and I think it may take more study to understand the full interaction of the North Pacific and the Tropical Pacific. It may turn out that ENSO is a periodic oscillation after all, it just takes decades if not centuries to complete one cycle. And, it may not as well. Since it may very well be that ENSO is driven primarily by changes in the Sun, the answer would depend on whether one thinks the Sun’s changes are periodic and how long that period takes. Your video takes too long: too long to download and too long to view. You need some format that is readily scanned, so that items of particular interest might be located and read. I am not new to WUWT. I am not new to El Nino, or climatology, nor to any of the natural sciences. I hope that you do not regard me as a troll for asking such questions. I am sorry that you think that I am simply ignoring what you post. I have seen your postings here and scanned them for a comprehensive treatment of the natural processes of El Nino-ENSO, of which I understand to some degree, but in your postings that I have viewed here, I saw nothing that addressed such natural processes in an adequate manner, in my view. I could buy your 561 page book, but so far I have seen no indication that you address such processes in that book, or that you understand the importance of giving such processes a thorough treatment. You see the problem. I hope that you profit from this criticism and that you do not refer me to something else that takes an hour to download (I have a slow satellite) and an hour to view. If you are going to post here, you need to address yourself to the problem of answering questions without attributing trolling to the questioner, or without referring him to such an impossible video, in my view. For the record, I am a confirmed skeptic. Thank you. …it seems you really can’t explain where the extra energy comes from. Go on, then. And in less than one sentence, please. @Bob Tinsdale, So are you saying or agreeing with the notion that La Ninas allow more insolation to be absorbed by the ocean waters and stored by 1) Reduced cloud cover 2) Exposing cooler water to heating (which increases uptake and reduces evaporative loss) 3) Some other mechanism? If so then wouldn’t we expect long term heating to be associated with an increase in the frequency or durations of La Ninas over El Ninos from past rates? Perhaps there is a relationship between the solar energy content of the ocean and the frequency of El Niño events. In other words, maybe the ocean is trying to reach an energy equilibrium and the El Niño is triggered more often when the energy (heat) is above a certain threshold. Thanks for the article. As I was looking at Figure 1, however, I was wondering what makes some of the squiggles El Nino or La Nina, I couldn’t quite remember.. So I looked around and found the ENSO pages here and there I saw some charts with lines for “El Nino Threshold” and “La Nina Threshold.” Now I think I understand. I at least comprehend your point. It would be helpful to passers-by who are working around edges of their knowledge If you added those lines to Figure 1. Bob, I read this as meaing that there can be El Ninos followed by El Ninos, without intervening La Ninas, and vice versa. I assumed that the meaning of “double-dip” in this context was a pair of La Ninas without an intervening El Nino, which does not seem to be the case from figure 1, and which you now say you didn’t say or imply. In which case, what do you mean by “double-dip” if it is not related to two adjacent La Ninas? I think there is a strong chance that is to at least some extent true. El Nino/Nina is a fundamental feedback mechanism. It is interesting that even Mann had paper in 2000 linking volcanoes to more frequent La Ninas and others have published showing increased El Nino in the year following a major explosive eruption and increased likelihood of La Nino three years later. Immediate release of ocean heat via El Nino to compensate for the blocking effect of volcanic ash and the later La Nina as a mechanism to recharge the ocean heat content for this loss. I can give you a list of numbers, you can plug them into an excel spreadsheet, and they will add up. They will tell you nothing, but they will add up. I guess what you are trying to say is that most alarmists have neat spread sheets with pretty numbers that add up – but tell us nothing. You have to attach meaning to the numbers, and that is where Alarmists have failed. Their numbers (models) have yet to predict anything accurately, or add to the body of knowledge in general. But like you indicate – they are pretty and add up. Oh yes, the corollary to the negative feedback is that the climate self compensates for much of the effect of volcanoes. This means that the already exaggerated volcanic cooling built into the models is unjustified. Significantly, this volcanic cooling is one factor that is used to justify pumping up the CO2 forcing from what the physics actually says it is and the roughly 3 times greater values of the models via unsubstantiated, hypothetical “positive feedbacks”. For surface surface temperatures, no; for ocean heat content, not necessarily. On the no side: During a period when El Nino events are dominant, more warm water than normal is released and redistributed from the tropical Pacific. Global temperatures have to warm during a multidecadal period when El Niño events dominate. BTW: There’s no “n” in Tisdale. Chris4692: Sorry for not including that in this post. I’ll try to keep that in mind for the remainder of this series. Thanks. Okay, so what is seen as “cycles” is irregular, somewhat chaotic. Non-linear. BUT, there are patterns, and if you can’t predict when an El Nino or La Nina exactly occur, there are probabilistic ways of looking at them. So, the finer point noted, take the historical non-cyclical events, if you will, and apply these shifts of something in time to the temperature cycles (are we allowed to say that the temperature profile has cycles or just historical events of rising and falling temperatures? ), we see there are correlations. Okay, correlations are not causations. Unless they are. But they could indicate common causuality and so be useful. If you push definitions too hard you find you know nothing about everything. What you are really saying is that nothing is deterministic, everything is probabilistic. Okay, now can we say that at a coarse level (say, of climate? ), there are internal variations due to cross-affecting mechanisms that for periods of time not quite determinable, produce fascimiles of cyclicity that can be used in a skeptical manner to explain the recent past and predict the near future? Some patterns are illusions, but not all patterns are illusions. And some patterns, though caused by unknown mechanisms, are useful, even if their use is temporary. An observation related to the article head image, December-February and the sideways V in brown shown as Dry. On a number of occasions I have noticed a warm streak from the tropical Atlantic diagonally across the Sahara to the middle east, such as in mapped RSS or UAH low troposphere data. Is there some kind of similar process going on with the seed core tropical South America instead of Indonesia region? 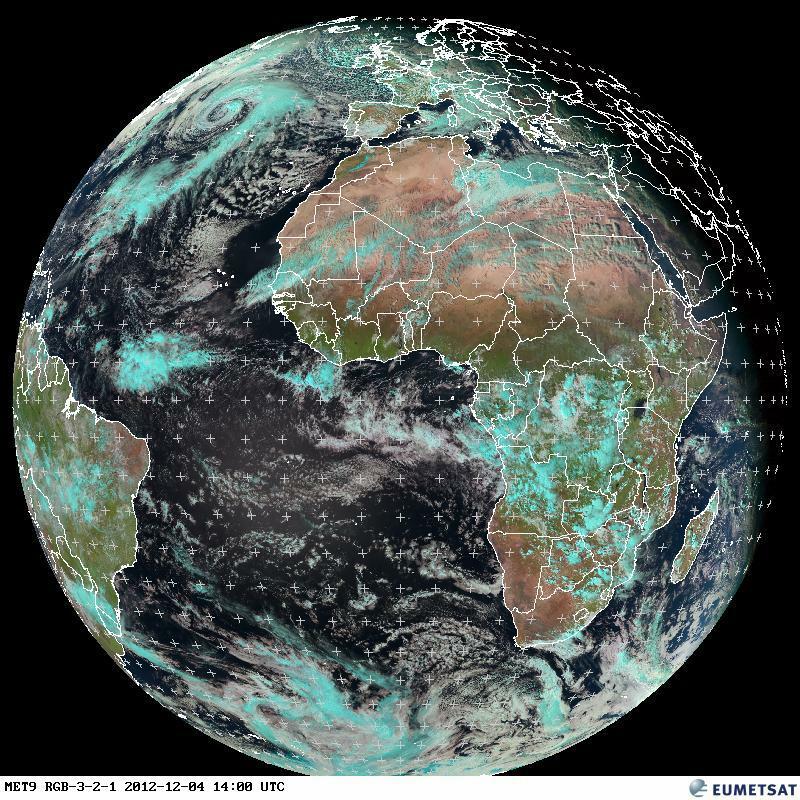 I note the clouds and warmth seems to avoid tropical Africa. Given this is part of the intense convective driver of the primary global circulation cells (Hadley) which lofts water but will tend to be drier and colder after raining out some of it, could this be involved in northward and southward flow? mpainter: Sorry if I sounded crabby in my last reply. It happens sometimes when I dictate through speech recognition software. I’m not as selective with wording, but it does save lots of time. They’re modeling something, trafamadore, but it’s not this Earth. No, the data describes the warming, it does not explain it. For instance it does not explain why the ENSO fluctuations have CAUSED ~0.7degC warning in the last few decades. It only describes the warming in the SST data. The data shows what is happening, not why. You might like to consider that atmospheric changes could be altering the amount of energy lost during the El Nino phases…. @-“Please provide a link to the dataset that presents the instrument-based temperature measurements for “several thousand years of ENSO”. Years ago I played around with a game named “Traveller”. It was a role-playing game with a serious math fetish. You could use their rules to design scientifically plausible (for that time, and given the limits of ’80s era calculators and PCs) planetary systems, for example. That game made math fun, turned me from a D-student in grade school to an A+ student through junior high and high school. I had massive spreadsheets that let me use their rules to design super-science vehicles. I remember a tank that was 3m high, 6m wide, 8m long — and with a gun whose “splash” covered the side of a 20-story building. It had a fusion power plant and an anti-gravity drive that let it fly. All the numbers added up. Something went in, sloshed around, and what came out was valid. According to the assumptions I built into the spreadsheet, which were the assumptions built into the rules, which were pure, unadulterated fiction. The “AGW scientists” may have models that “add up”. That “math thing” may line up for their programs. But what are their underlying assumptions? Are those assumptions valid? So I’m doing a little thinking out loud here. I don’t claim to have any special knowledge but I’m wondering if looking at temperature anomalies over the long term is the correct way to classify El Nino/La Nina events? Might it be more appropriate to look at the magnitude of change from the last min/max? Right now we’re in ENSO neutral conditions but this year the weather is acting more like a major El Nino is underway…. at least here in California. The typical California winter starts out in the fall with a number of cold lows dropping down from the Gulf of Alaska and/or “inside sliders” that produce a number of north wind events after their passage. Then during January/February/March the storms come more out of the west with somewhat warmer temperatures. There are seldom any north wind events after these storms. Then there’s a return to the more northern storms in March/April/May with some more north wind events. La Ninas often lack the warmer mid winter storms producing a colder winter. El Ninos have a much longer period of warm westerly storms often beginning in the fall and lasting through a portion of spring. There are fewer and weaker north wind events. So far this fall is following the typical El Nino pattern, few early cold storms and north wind events and an early start to the warm westerly storms; i.e. the pineapple express or atmospheric river events. The temperature anomalies show a substantial positive swing from the last La Nina minimum even though current temperatures haven’t risen to official El Nino status. Is this going to be a strong El Nino winter with more flooding to come in California? April 15th, 2013 will be a good time to look back on the winter of 2012/13. A “Kung Pow: Enter the Fist” reference? Nice. Your contribution to our scientific understanding of ENSO and related matters is huge, Mr. Tisdale. You are attempting to change the focus of modelers and so-called climate scientists and to place that focus on the physical processes that make up ENSO. Reminds me of Galileo. And you are right. There will be no understanding of ENSO until there is serious empirical research on the underlying and mostly unknown physical processes that make it up. Just trying to help, Bob – sinus health is sadly neglected these days ;). If it’s understood that an ENSO cycle may not lead to another series of El Niño and La Niña events nor even lead to the opposite phase, then cycle is applicable. It looks like what you have is a cyclic process (such as that clearly shown in Figure 1) in which the highs sometimes do not get classified as “El Niño” and the lows sometimes do not get classified as “La Niña”. Is this something more than a debate or a confusion about where to draw the line to declare “El Niño” and where to draw the line to declare “La Niña”? What you have described is less secure for declaring something “present” vs. that same thing “absent” than, say, deciding whether an electron is “present” or “absent”, or a proton is “present” or “absent”. What you have described is more like deciding the hematocrit of blood satisfies the criteria for accepting a donation than it is like typing A, B, and Rh. The “explaination” of higher satellite trends with trade winds leading to higher sea level rises in open sea is not valid. For an increase, there have to be ADDITIONAL trade winds to form that deviation. and those ADDITIONAL trade winds would have had to be sustained for many years and just have started in the year when the satellite record started. But thats not all, additional trade winds would have to blow from coast to open sea anywhere in the world and not from east to west. It is much more safe to assume, that satellite trends are inflated and tide gauge data are correct. I was told to look into thermohaline circulation. I guess if i don’t see a post on here (hint hint Mr Watts) I’ll see if i can find somebody to explain it in simple terms. Is it possible that you can actually believe that the climate system is 100% passive? That the oceans have negligible heat capacity? That ocean-atmosphere dynamics have no complexity and are always at 100% equilibrium? Well I guess that if your co-religionist David Graber can assert for the AGW community that “humans became a cancer on the earth one billion years ago” [sic] then, well, anything is possible. This post explains briefly why energy increases in the atmosphere from ENSO over many years and how ENSO changes to lose energy over many years. A 4 percent increase in global low cloud levels will put the Earth back to global temperatures of the 1970′s. Anyone dismissing solar warming without even considering this important observation of the period is down to ignorance. Notice El Nino’s roughly got stronger during the period while global low cloud albedo was declining. Since 2006 low global cloud has stopped declining therefore based on the ENSO knowledge so far future El Nino’s will not be stronger than the 1997/98 one unless a further decrease in global low cloud albedo occurs in future. Therefore based on what’s been happening recently El Nino’s should become stable/weaker and any increases in global low cloud albedo in future will further weaker them. The process of ENSO moving warm surface water around the globe towards the pole will be reduced and therefore rises in global temperatures also reduced. This will then lead to peaks and troughs in the ENSO swings at lower levels than compared over the recent warm period. 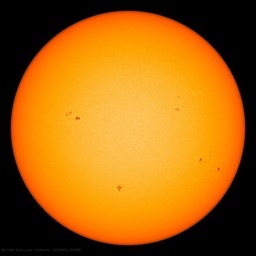 This is because when the solar activity reached an increased level during the 1950′s the trade winds were generally strong over this period right through to mid 1970′s. These resulted in plenty of up welling ocean water and warming ocean water from the sun was piled towards the western side of the Pacific Ocean circling to greater depths. This resulted in energy not calculated in surface temperatures because it was below the surface and not allowed to spread east over the ENSO surface region. Data during this period in the ocean depths were very limited so missed this increased energy around the western areas of the Pacific Ocean. Post 1970′s the trade winds declined for longer periods especially beginning with the Pacific shift and moderate/strong El Nino in the early 1980′s. This resulted in the warmed sub-ocean water that had not been calculated over the recent decades surface temperatures, (1950/1960′s etc) surfacing across the central and eastern Pacific and warming global temperatures in it’s wake. This process delayed the warming from the increased solar cycle until the trade winds become weak and allowed warmer water to form much more over the surface and be eventually lost by the atmosphere. Suddenly this warmed the planet from the tropics to the poles via the process of ENSO. ENSO contributes towards warming of the atmosphere over the past few decades by moving and allowing energy build-up on the surface instead of downwelling in the western Pacific ocean. The trade winds determine the difference between moving energy to the surface and down-welling in western regions with central and eastern ocean regions upwelling over a long period. Down-welling removes energy from the surface and prevents it’s loss from the atmosphere. Upwelling in central and eastern regions of the Pacific ocean prevent solar warming of the surface from building up and pooling. Low cloud albedo determines how much the sun warms the ocean surface in making the next ENSO event stronger or weaker. Weak trade winds generally favour El Nino’s and strong trade winds La Ninas. Bob, being a complete neophyte on this subject, your description of a cyclic but non periodic interaction reminds me of looking at the surface of a heated pot of water prior to coming to a boil, There are swirling patterns on the surface that are certainly cyclic but non-periodic and completely unpredictable. Like the Kelvin-Helmholtz Instability, I’m sure the process can be modeled with CFD software in a general way to produce similar looking patterns but such models are totally useless in predicting what will be going on at any specific point in an actual specific pot of water because the process is chaotic in nature. Am I on the right track in understanding what you are trying to get across? The ENSO is well described as a nonlinear oscillator as has been discussed here several times, and indeed as Bob alludes to in his delayed oscillator theory in his ENSO book. Have a look at the X and Y plots, with alternating phases with high cycles and low cycles (e.g. fig 4.1, 2.7). Then consider periods of alternating dominance of el Nino and La Nina? Can one discern a pattern or a connection here? Jester Via: I don’t believe that I’d categorize in that fashion. The “normal” state of the tropical Pacific is dictated by the interaction between trade winds and the temperature gradient between the eastern and western tropical Pacific, where it’s about 7 to 9 deg C cooler in the east than it is in the west. The trade winds draw cool water from below the surface in the east, along the equator. The temperature gradient is caused by the sun warming that cool water as it travels from east to west, driven by the trade winds. But the trade winds are driven by the temperature gradient. That is, because the water’s warmer in the west, there’s more convection there, causing the air to rise. The trade winds make up the deficit caused by the rising air. At altitude, the air cools as it travels east and then drops in the eastern Pacific, completing the loop (called a Walker cell). There’s positive feedback between the temperature gradient and the trade winds (called Bjerknes feedback). Back to the warm water traveling from east to west: That wind-driven, sun-warmed water runs into land in the western tropical Pacific and “piles up” there, so it’s physically higher in the west than in the east. The warmer water is held in place by the trade winds, but gravity wants to level the playing field. The trade winds, temperature gradient and gravity all interact, all balancing against one another. With the positive feedback, that state will exist until something throws it out of balance. Then, along comes a weather event like a tropical cyclone in the western Pacific, which disrupts the balance by slowing the trade winds. If the trade winds weaken enough and the weakening lasts long enough, gravity will win and the warm water in the west will slosh east (the initial wave is called a Kelvin wave) and an El Niño will start. That of course assumes there’s enough warm water in the western tropical Pacific to support an El Niño. This year there wasn’t a whole lot of warm water so this El Niño isn’t very strong. But a year before the start of the 1997/98 El Niño, there were unusual weather conditions during the 1995/96 La Niña, which pushed aside the cloud cover and allowed the sun to create a bunch of warm water. The end result was the 1997/98 super El Niño. Hmmm, looks like a rambled on there, but each time I explain the basic process, I present it a little differently and it helps everything click for someone else. Also note, that explanation doesn’t include the warm water that’s left over after the El Niño, which climate scientists overlook. The variations taking place in the tropical Pacific are typically classified as an El Niño when the sea surface temperature anomalies in the NINO3.4 region rise above a threshold of +0.5 deg C and as a La Niña event when they drop below the threshold of -0.5 deg C.
BUT, big but, relying solely on an index gives the wrong impression of what’s taking place and does not recognise the differences between El Niños and La Niñas. A La Niña is simply an exaggeration of the normal state of the tropical Pacific. During a La Nina, there are stronger trade winds, more upwelling of cool water in the eastern equatorial Pacific, less cloud cover and more sunlight entering and warming the tropical Pacific waters as they travel from east to west. On the other hand, during an El Niño, the state of the tropical Pacific changes: The Equatorial Countercurrent in the tropical Pacific engorges and carries much more warm water than normal from west to east, flooding the central and eastern tropical Pacific with warmer-than-normal warm water. (It’s warmer than normal because the water in the western tropical Pacific is typically 7-9 deg C warmer than in the east during ENSO-neutral and La Niña conditions.) The trade winds in the western tropical Pacific reverse and become westerlies, and the convection/cloud cover/precipitation accompany the warm water to the east, which disrupts the atmospheric circulation patterns globally. I think I’ve got what is being said. There has been no global warming. It is just a matter of a redistribution of heat. Or is it the clouds? I’m sure you must be aware of this, but it is the case that average global temperature since 1958 [the start of the Mauna Loa CO2 series] is a very interesting match for a linear scaling of the monthly MEI [multi-variate El Nino index] when accumulated. I was looking for something a little more complex than this when I stumbled on it some time ago. So, the people arguing that a cyclical ENSO would not impact the climate would be right: but the fact is, that during the period of rising temperature from the 70’s to 1998, the MEI index was more positive than negative. Since then El Nino/La Nina has been in balance, and temperature is flat. Have you any comment on this? Wanna try again, izen? You’re going to have trouble responding because there was little ship traffic across the eastern equatorial Pacific before the opening of the Panama Canal in 1914. With respect to the earlier part of your reply, izen, I’ll be happy to show you and everyone else reading this thread why you’re incorrect. The following three graphs are from an upcoming post. It’s a blog memo to John Hockenberry about some sleight of hand in the PBS special “Climate of Doubt”. Here in the midwestern US we continue to be in a dry weather pattern, and we need some serious rain in the coming months…..
North Carolina needs some serious rain too. Mostly our rain comes from the west over the Appalachians so if you are dry so are we. Unless of course we get plastered by a hurricane. Thank you again Bob for your videos. They were very clear and informative. Response: You might not understand the IPCC models, which you reference above. You certainly admit you cannot look at answers provided to your own questions because the answers might be more complex than you would like. We on this blog are willing to help, but do not appreciate sarcastic condescension. My advice is to seek to learn from people who understand the complex and can explain it in simple terms. The IPCC models have largely and continually predicted things which did not happen. Their models continually change as real data present a different outcome. By chance, some of their dozens of model outcomes have been close… but most of them are simply way wrong. And the wrong models are used for Policy makers to tax carbon!!! I assume you do not know this, which is why I have spent the time to let you know. You could find the projections of their models in earlier IPCC reports, but then again, I assume that you will not, since it’s not simple to know the truth for you. I have one question: Since you are unwilling to actually look at information, where is it that you get your ideas from? Bob Tisdale: A La Niña is simply an exaggeration of the normal state of the tropical Pacific. … . On the other hand, during an El Niño, the state of the tropical Pacific changes: The Equatorial Countercurrent in the tropical Pacific engorges and carries much more warm water than normal from west to east, flooding the central and eastern tropical Pacific with warmer-than-normal warm water. How can you tell that the El Niño does not emerge from an oscillatory process, or a set of oscillatory processes? Do you know what causes an El Niño to occur? If that’s in your other writing or your book, I’ll go there. Here you make it sound like an agent that happens to act on its own, or a process that starts without prompting. Bob, Thanks for the more detailed explanation. What you described is similar to what I would call a relaxation oscillator, a type of electronic oscillator that has relatively poor spectral purity due to the influence of noise. As the capacitor charges, it approaches an unstable situation, a tipping point, where a switch will suddenly trip and discharge the capacitor. Any noise present influences the exact moment it switches. The noise, in this case, can be some extreme weather event and large enough that it can cause the switch before much energy is stored in the capacitor, making the discharge a less noticeable event. Additionally, even the charge rate of the capacitor is weather dependent making the repetition rate even less of a periodic function. Bob, After watching your video, I find a flaw in my relaxation oscillator analogy. The capacitor never charges to the tipping point but only charges to just under the tipping point and sits there until triggered by some event. That charged state is the ENSO – neutral state waiting to be triggered like a mousetrap.. Now I understand why you say it isn’t an oscillator at all. The fact that you wrote a book, does not lend you credence. Illustrating an understanding of complex systems does not seem like your forte’. You did a fine job using elementary science to describe that wind blows water in one direction, and that it has to go back eventually. Then you go into detail explaining how wind blows water. Your description does not offer a valid argument against what Tisdale shows in detail. Perhaps it’s semantics to you, or you can’t stand the idea that someone else sheds light on an area of science that antiquates your simplistic description of how wind blows water. Perhaps to a layperson, but it’s a bit more complex than that as used in science. A system like x = cos(2*pi*3*t) + cos(2*pi*5*t) is clearly oscillatory, but you don’t have strict “up and down” behavior. It’s a spectral periodogram. I averaged it to make it smooth (this just beats down the “whiskers”) The peaks look a bit funky compared to what you’re used to, because I computed the transform in frequency space then mapped it in to period = 1/f. At least over the period I’ve looked at (1950-now), this result seems very robust. I’ve seen efforts to do both of these today at the AGU meeting–somebody was using KF to study the effect of solar forcing on the temperature field. I saw somebody else examining Kelvin waves (which of course are related to ENSOs). I would think this particular system would be very amenable to KF. My suspicion is one could develop a framework (two coupled modes) that had some real forecast skill. The fact you see peaks at 3 and 5 years tells you that there’s coherent energy in narrow frequency bands about these frequencies. That’s what lets us call it oscillatory. If the frequency bands went to zero as you increased the temporal window, we’d go further and call it “fixed frequency oscillation” or FFO. If the frequencies have a finite width (and no visible subharmonics) we would conclude the process is “quasi-periodic”. The source of the nonstationary behavior seen here isn’t probably well understood but the main prediction of having two frequency peaks at 3 and 5 years is that you don’t get a simple progression between El Niños and La Niñas. If I understand it right, that’s the real point you’re making in any case (in any case it’s an important regardless of whether 9 of 10 scientists would still call the system “cyclic”). Carrick: You missed my point. Physically, they’re independent events. Lester Via: Pardon my misspelling of your name in my December 4, 2012 at 1:45 pm comment. The leftover warm water from the 2009/10 El Niño may have caused a minor upward shift in the sea surface temperature anomalies of the Atlantic-Indian-West Pacific oceans (90S-90N, 80W-180). It’s a bit early to tell, though. Take a look at Bob’s figure 1 and compare it with the X and Y plots in this article on chaos. An oscillation with alternating periods of predominance of high and low values points to a nonlinear/nonequilibrium pattern system controlled by a Lorenz attractor. 1. Cross-equatorial tropical cyclones in the western tropical Pacific. This refers to a time when one tropical cyclone exists north of the equator in the western tropical Pacific, while, at the same time, another tropical cyclone exists there but south of the equator. The tropical cyclone winds in the Northern Hemisphere rotate counterclockwise and in the Southern Hemisphere they’re clockwise. Between them, the winds would be traveling from east to west. These are discussed in Keen (1982) “The Role of Cross-Equatorial Tropical Cyclone Pairs in the Southern Oscillation”. 2. A single cyclone and series of cyclones in the western tropical Pacific. These are discussed in Hartten (1996) “Synoptic settings of westerly wind bursts”. 3. Cold surges from mid-latitudes, discussed in Harrison (1984) “The appearance of sustained equatorial surface westerlies during the 1982 pacific warm event”. 4. Convective cloud clusters associated with the Madden–Julian oscillation (MJO). Refer to Zhang (1995) “Atmospheric Intraseasonal Variability at the Surface in the Tropical Western Paciﬁc Ocean”. Paleoclimate reconstructions are just as instrumental, or make-believe as thermometer, rain-gauge and satellite sensor data. To pretend they do not provide a record of the ENSO process in the past is a silly and egregious position that suggests that you wish to avoid some aspect of the historical record because it refutes your claims. Well there is always the altered radiative transfer in the atmosphere as a cause. As you may be aware there are measured increases in downwelling energy, an effective reduction in the rate of energy loss from the surface. An event series, though with some degree of cyclicity, as low solar conditions tends to happen more at particular points in the sunspot cycle. Are you now suggesting that global temperatures respond differently to El Nino and La Nina events? That’s what it sound like. No, I am suggesting that the rate of energy loss is proportional to the fourth power of the temperature, so is higher during the higher temperatures of an El Nino, but is mediated by the radiative transfer within the atmosphere. When the atmosphere contains more of a substance that can thermalise electromagnetic energy into kinetic energy of the molecules of the atmosphere more thermal energy is retained near the surface, thereby keeping more thermal energy than would have been lost without the effect of more IR to thermal conversion molecules in the atmosphere. Thank you, but let me say that I understand that El Nino and La Nina is not a sine wave and can not be modeled as one, though it looks the same. The equation you provided as an analogy is predictable, while ENSO is not. Just plug in some t=time into your equation and you get a point along the oscillation curve of that equation. The point is subtle but not insignificant. I think Tisdale does a fine job illustrating strong evidence that ENSO processes do more than simply exhange heat to and from the oceans. The phnomenon described as ENSO have shown to be able to create conditions which can lead to more net heat store (albido and other changes). I also do not have the credentials to put words in his mouth so to speak. The term oscillate implies something. Then you haven’t replied to my earlier question (which was “Why does the Rest-of the-World data warm only during those El Niño events, izen? Because, it very obviously does not cool proportionally during the La Niña events that followed those big El Niños.”). The fact that you provided an answer to that question strongly suggested that you acknowledged the existence of those divergences. Now you say no and provide a more detailed answer, but it’s difficult to determine what you’re responding to if you’re now not acknowledging those divergences. What question are you replying to or are you simply writing for writing’s sake? Do you see any similarities between the two reconstructions? Why would you think they would have any value in a study of the impacts of ENSO on global temperatures, izen? 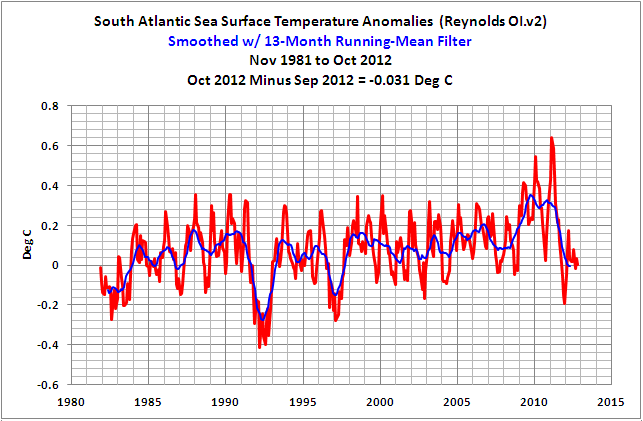 On the other hand, Smith and Reynolds (2004) called the satellite-era OI.v2 sea surface temperature dataset “the truth”. The paleoclimatological record doesn’t refute my claims. My discussions are for the satellite era of sea surface temperatures—the last 30 years–for a specific reasons. First is the dataset. It’s the best there is. Second, if the greenhouse gas-driven global warming hypothesis doesn’t work during the satellite era of sea surface temperatures, a period when the IPCC’s climate models say the warming have to come from greenhouse gases, why would you think it worked during the other portions of the paleoclimatological record? It appears to all reading this thread that you cannot refute what the satellite-era data says, so you’re introducing your unwarranted beliefs in paleoclimatological data to distract from the issue. There are more kinds of oscillation than you itemize. There are quasi-periodic systems where the system never returns to exactly the same state twice, but recurrently returns to each region in the state space almost periodically. The complete region within which the system spends its time is called a “strange attractor”. A physical/biological example is heart beat. Again “swing back and forth between two points” is a lay definition of oscillation. ENSO can be defined in terms of two state El Niño and La Niña, so it’s cyclic. ENSO can be defined in terms of a continuously changing variable (e.g., temperature in the ENSO3.4 region) so it is further oscillatory. ENSO3.4 temperature anomaly has two sharply defined frequency components near three and five years, which are not and would not be expected to be fixed frequency, so it’s a quasi-periodic oscillation. This is a good example and is similar in some respects to the phenomenon we’re looking at here. -Weather Cycles: Real or Imaginary (Second edition) William James Burroughs Cambridge University Press. if its a chaotic nonlinear one, that is. It cant be corrected for like a linear oscillator, Bob is correct about this. You do need a nonlinearly coupled system to get the ENSO behavior, but it doesn’t have to be chaotic. If you have two coupled modes that are quasi-periodic according to the spectrum I showed above, almost any physical model that realizes this is going to have nonlinearity associated with it. The observations also suggest that El Niños are “catastrophes” in the dynamical systems sense. Bob – Has anyone come up with a predictor for the El Nino Index? El Ninos are total collapses of the normal and La Nina states, where La Ninas are simply an exaggerated-normal state. Bob Tisdale: El Ninos are total collapses of the normal and La Nina states, where La Ninas are simply an exaggerated-normal state. “Total collapse” isn’t that useful a concept. I bet you will find it worthwhile to revisit the “catastrophe” idea of dynamical systems some day. An example might be quasi-periodic spike trains produced by the nonlinear continuous dynamics of a neuron. Bob, I love your posts and found the video very informative and well done. Not long enough as far as I was concerned. But I am still left some questions. Most of them have to do with where the heat comes from that ENSO redistributes around the world. I gather that the source of it is tropical sunshine warming the equatorial pacific waters. So my question is, why has that been increasing over the last 30 years, raising ocean heat content, and not just evening out? Why the step up to new levels, rather than just back up to the same level? I understand from the video how the La Nina events account for the ocean heat increase, and the subsequent spreading of that heat by El Ninos. But why have the La Nina’s put so much heat into the oceans during this time, for the El Ninos to spread it around and warm the whole atmosphere? I get the logic that this is hard to account for by purely GHG forcing, but I still don’t see where it is coming from. Is it a decrease in cloud cover over the tropics? Why so much decrease then? What is driving that? It even makes me wonder how the oceans warm up to begin with. Is it only through direct sunshine? Does the GHG effect have any direct influence on ocean heat or surface temps? I understand how GHG effects can trap heat in the atmosphere, but can they have that effect on the oceans as well? What do the AGW people claim in that regards? I know these are a lot of basic questions that may take too long for you to answer. Perhaps you could point me towards some links that do. A fundamental property of ENSO is the apparent phase-locking of ENSO to the seasonal cycle (Rasmusson and Carpenter 1982). This phenomenon is often referred to as to the spring persistence barrier or the spring predictability barrier because in April and May a large drop in the persistence causes poor model prediction of ENSO. The phase-locking of ENSO can be observed most readily as the peak of ENSO events tends to occur at the end of a calendar year. To understand the mechanism for this phase-locking, the seasonal propagation of the anomalous trade winds needs to be identified. During an ENSO event, the changes in the Walker circulation lead to anomalous convection in the Western Pacific and anomalous winds over the Central Equatorial Pacific. Because of the change in the solar angle throughout the year, the latitude of these anomalies shifts south in January-March as the peak solar radiation moves south of the equator (Clarke 2008). Gadgil et al. (1984) showed that when SSTs reach 28°, convection can occur. So as the water south of the equator warms, the convection shifts southward causing wind anomalies to do the same. The propagation of the anomalous winds southward at the beginning of the calendar year removes the positive feedback of ENSO. For instance, during a warm event the anomalous westerlies allow the SSTs in the Eastern Pacific to warm. As this anomaly moves south, the thermocline depth begins to shoal and SSTs cool in the East Equatorial Pacific thus ending the warm phase. Therefore, the demise of ENSO events is significantly phase locked to the seasonal cycle even though these events do not always occur at regular intervals. Also, what causes the increase in the strength of the trade winds, that creates La Nina conditions? I say, exactly… then say quasi-periodic. I was speaking of oscillate. The definition of oscillate is not the same as quasi oscillate. That remains to be seen. These processes may not be deterministically predictable, but they can be statistically predictable, with an expectation and error bars. A big IF. Some phenomena in nature are chaotic. Others are merely complex, and can often be decomposed into simpler, predictable parts. Sometimes, they are both. Even chaotic systems can be statistically predictable – I worked out a statistical characterization of the Baker Map for a class in chaos theory a couple of decades ago using the Chapman-Kolmogorov equation. I understand, but oscillate is misunderstood to mean oscillate, when in fact the system does not oscillate… it kinda sorta oscillates and no one can predict or model it… Most people mis-believe El Nino and La Nino switch back and forth and have no net influence on heat balance. But they do not switch back and forth and do indirectly affect heat balance. That is the point being made, I believe. If you are saying that it has some resemblance –then fine, I get it. But can’t you see past the simplicity of the argument here? Defining something by a very specific name, when that something is only “kinda-sorta” sometimes like that name, you lose my attention by not seeing the big picture. I guess I could say that you and I are quasi correct… but that’s too fuzzy, weak and does not give credence to current understanding. I know one argument that has recently been brought up to defend CAGW is that ocean heat content has been increasing even more than atmospheric temperatures. Does this mean that the eastern Pacific Ocean has been simultaneously transferring heat to the atmosphere as well as greater amounts to the oceans? And can we surmise from this that for some reason, the “energy capture efficiency” of La Ninas has increased in the past fifty years? Also, how was it determined that it is visible wavelength radiation which provides the energy that a La Nina transfers to the ocean? Could it not be that, if there is an upwelling of deep, cold water to the surface, the difference in temperature between this colder water and the atmosphere, which increases the heat transfer from atmosphere to ocean is a sufficient mechanism to explain the phenomenon? After all, the modified cloud patterns observed during a La Nina are the result of a colder atmosphere. If the atmosphere cooled, it means its heat content went somewhere. Most probably it lost its heat to the cold water below, no? In other words, the dimnished clouds during a La Nina might not be the mechanism through which energy is gained by the ocean (through increased visible wavelength radiation), but rather a result of the transfer of atmospheric heat to the cold water of a La Nina (that seems, at least, like a possibility to me). big IF. Some phenomena in nature are chaotic. Others are merely complex, and can often be decomposed into simpler, predictable parts. Sometimes, they are both. Even chaotic systems can be statistically predictable – I worked out a statistical characterization of the Baker Map for a class in chaos theory a couple of decades ago using the Chapman-Kolmogorov equation. A posting a year or two ago explored the possibility that the ENSO might be a nonlinear oscillator analogous to the Belousov-Zhabotinsky reaction. The critical condition for this classic chemical nonlinear oscillator is the presence of an “excitable medium”. This means a medium in which certain processes set of a positive feedback and a run-away event is launched. Of course “run-away” is not in the “for ever and ever amen” variety of AGW idiocy, but a time-limited period of positive feedback that runs its course. In a far-from equilibrium system where there exists potential positive feedbacks, this then is an “excitable medium” and nonlinear oscillations such as the BZ reaction can occur. Look for instance at the alternating patches of orange and blue in the (first) BZ video here – they call to mind the alternating cool and warm east pacific under La Nina and el Nino conditions. In the equatorial east Pacific the requirement for an “excitable medium” is met by the Bjerknes feedback, by which Peruvian cold upwelling is self-reinforced by consequently enhanced tradewinds giving a time-limited positive feedback. Vice versa in an el Nino. In this sense Bob Tisdale is correct that el Nino and La Nina are discreet events of time-limited positive feedback, but they can be considered as such in the context of a nonlinear oscillator. ENSO index down again this week, continuing an erratic decline, I predict a negative Nina 3.4 anomaly by 2013. But to save those reading this thread the effort to click on the link, here’s my reply to Conrad. Conrad, based on the rest of your comment, you understand the relationship between ENSO and tropical Pacific ocean heat content. So I won’t go into that explanation. The primary problem we have with ocean heat content and sea surface temperature data is there’s too little data. Reliable sea surface temperature measurements for the entire globe exist only for the past 30 years—the satellite era. Before that there’s very little source data in the southern hemisphere, south of 45S, and that’s a lot of real estate. Therefore, we have no idea what type of multidecadal variability exists in the Southern Oceans. No idea at all. Further, because of the limitations of the pre-satellite era data, no one can say that the past 30 years is outside of the normal. Climate models are simply computer-based conjecture, based on a flawed hypothesis. It’s even worse for ocean heat content data. We’ve only had complete coverage of the global oceans for a decade at best. Before that there’s little to no data at depth in the southern hemisphere south of the tropics. I still find it amazing that we can see the relationship between ENSO and tropical Pacific ocean heat content—thanks to NOAA for have the foresight to install the TOA project buoys there in the 1980s and ‘90s. To answer your question, it simply appears to be the frequency of the 3-year La Niña events in the tropical Pacific—and the freakish 1995/96 La Niña. Without that 1995/96 La Niña, tropical Pacific ocean heat content data would be no higher today than it was in the early 1990s. The above should also serve to answer some of your later questions. Yes, it’s the periodic decrease in cloud cover over the tropical Pacific, which is associated with the stronger trade winds during La Niña events. What’s driving it? No one knows why ENSO has the frequency, magnitude and duration it does. If they did, the IPCC’s climate models would be able to simulate ENSO, but they can’t. If someone knew what drives ENSO, all of the ENSO models used in El Niño and La Niña predictions would be able to provide reasonable forecasts of the next ENSO season before the springtime predictability barrier, but they can’t. There are a number of other factors that can cause sea surface temperature and ocean heat content to warm. For example, when there’s an El Niño, the trade winds slow in the tropical Atlantic. The slower trade winds mean less evaporation, so the sea surface temperatures and ocean heat content for the tropical Atlantic warm. If there’s a multidecadal period when El Niño events dominate, the Atlantic trade winds would be slower than normal for that multidecadal period, which would, in turn, cause sea surface temperature and ocean heat content to warm more than normal. The AGW people claim the ocean warming (sea surface temperature and ocean heat content) was caused by back radiation associated with CO2, but the data contradicts them. Therefore, it appears the additional infrared radiation from manmade greenhouse gases only increases evaporation. Add to that, no one knows whether clouds provide positive or negative feedback. The ocean heat content and sea surface temperature data indicate they warmed naturally, and the natural warming of the oceans account for the vast majority of the rise in land surface air temperatures. The introduction to the delayed oscillator theory in my book is written at an even more basic level. I assume you are referring to the well-known phenomenon of the delayed-feedback nonlinear oscillator. You tell me. Does the definition of “delayed oscillator theory” at the IRI website agree with the “delayed-feedback nonlinear oscillator”? The oceans release heat primarily through evaporation so the East Pacific has been releasing heat. Second question, I do not believe anyone could state the “‘energy capture efficiency’ of La Ninas has increased in the past fifty years.” The 1995/96 La Nina was a freak and it effectively shifted upwards the ocean heat content of the tropical Pacific. Other than that La Nina, the only other times there were long-term warmings of the tropical Pacific was during the 3-year La Nina events. Also, if the 1995/96 La Nina did not supply the warm water for the 1997/98 El Nino, would it have been as strong? And if the 1997/98 El Nino was not as strong, would there have been a 3-year La Nina following it? The variations in the temperature of the atmosphere are responses to the temperature variations of the ocean, not vice versa. The oceans have to warm and cool for the atmosphere to warm and cool above them. PS: Sorry for the delay in replying. I got sidetracked elsewhere. I hope I got to everyone’s questions. For a larger perspective on oscillations in nature, peruse “Biochemical Oscillations and Cellular Rhythms” by Albert Goldbeter and “Dynamical Systems in Neuroscience” by Eugene Izhikevich. Plus the dynamical systems books cited by Izhikevich. Bob Tisdale has shown that, if you narrow the scope of the word “oscillation”, then El Niño and La Niña events are not manifestations of a natural oscillation. His explanation that El Niños result from a change in wind leaves open the possibility that they are catastrophes in a naturally oscillating non-linear dissipative dynamical system. Most of the oscillations in nature, including the seasonal temperature swings on earth and the tides, are not exactly periodic and produce phenomena that appear dramatically different from the usual peaks and troughs. Ok. So one more question for you which I think will summarize the explanation: I’m not a genius, but I think I understood… Basically, the extra heat in the system in the past decades has come from a sequence of stronger and more numerous La Ninas, simply put. …And one last question… Are there any clues as to what the system would be that has caused La Ninas to input more heat into the system than El Ninos could discharge in the past decades, as well as what regulates this process (i. e.: when and why does the trend reverse and cause a period of stability or cooling, if El Ninos start discharging more energy than La Ninas can brin into the system). JC Leblond: In reply to your December 7, 2012 at 4:24 pm comment, publically available ocean heat content data only extends back in time to the mid 1950s. 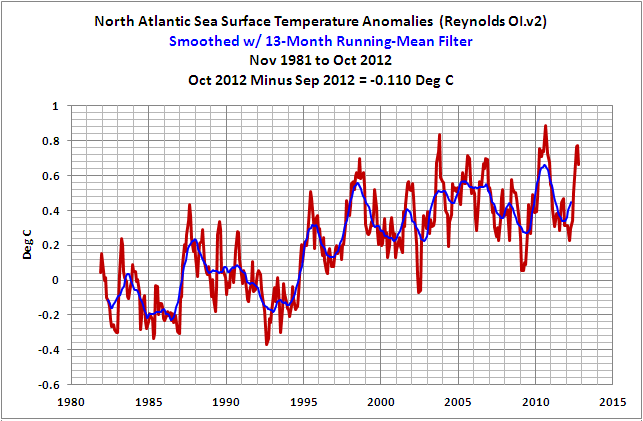 Satellite-era sea surface temperature begins in the early 1980s.